Sintra is a charming Portuguese town, and is the best day trip from Lisbon. 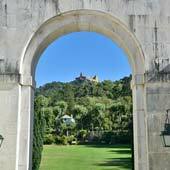 Sintra is situated within the hills of the Serra de Sintra, and found within this region are extravagant palaces, ruinous castles and opulent mansions. 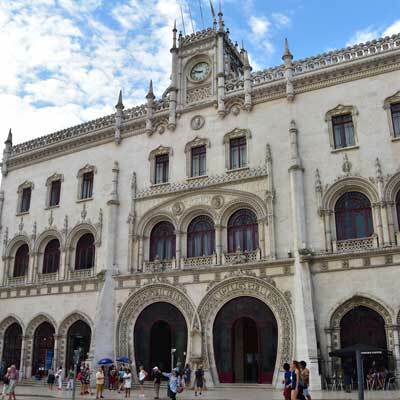 Lisbon is connected to Sintra by two train services, and these convenient and inexpensive rail services make it very easy to visit Sintra as a day trip. This article will explain how to travel from Lisbon to Sintra, and includes information on both train services, the stations and other useful tourist advice. 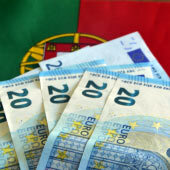 Sintra is 25km to the west of Lisbon, and the recommended means of travel, is by train. We strongly discourage driving to Sintra, as the narrow hill roads are not designed for the heavy tourist traffic and there is very limited car parking. During the summer season, there is a permanent traffic jam within the historic centre, as frustrated drivers hunt out the few parking spaces available. There are bus services to Sintra, but the journey times are longer than by train, and the locations of the bus stations are not as convenient as the train stations. 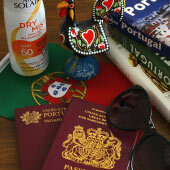 The remainder of the article will discuss travelling to Sintra by train. The Rossio-Sintra service is the one typically used by most visitors, as it departs from the historic centre of Lisbon, which is closer to the popular tourist districts of Baixa, Alfama and Chiado. 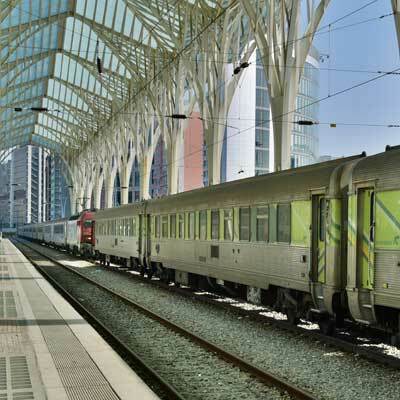 The Oriente-Sintra service is generally used by those visitors travelling from the airport, the Sete Rois bus station or Oriente station, which is also the main intercity train station of Lisbon. Details of these connecting services are explained later on in this article. 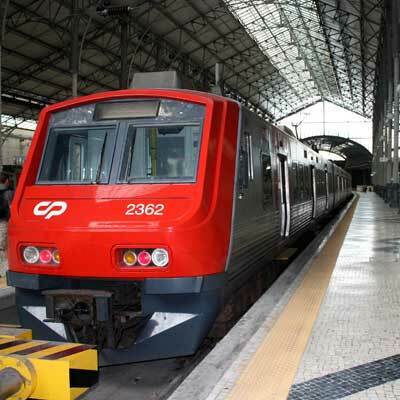 The trains to Sintra are part of the Lisbon urban train network and are operated by Comboios de Portugal (often just shortened to CP), which is the national train company of Portugal. As the Lisbon to Sintra railway is an urban route, tickets and seats cannot be pre-booked, but there is no real need as there is usually plenty of free seats. Due to the popularity of Sintra there can be long queues at Rossio station for tickets (not to mention the queues at the tourist attractions of Sintra); our advice is to always start a trip to Sintra as early in the day as possible. The train fare is charged to the reusable “Viva Viagem” public transport ticket, which is used for Lisbon’s buses, metro and trams. The initial purchase price for this card is €0.50. The train fare must be charged to an empty “Viva Viagem” card, if there are any unused metro or tram fares still remaining on the card, a new card must be purchased. 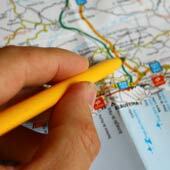 The Viva Viagem ticket holds the fare for one person, meaning each traveller in a group will need their own card. 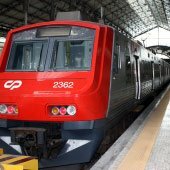 •	24-hour unlimited use of CP Lisbon urban trains (€6.00) – No point unless you are going to use the train for more than three journeys. 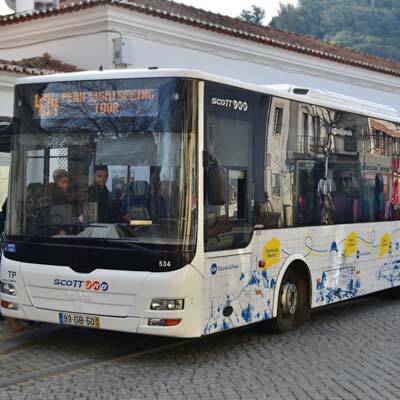 This could be useful if travelling to Sintra from Cascais or Estoril, but there are direct bus services. 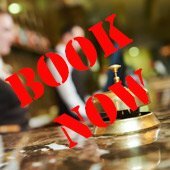 •	24-hour unlimited use of CP urban trains, metro, tram and Carris buses (€10.55) – Only useful if you are based in Sintra and planning a day trip to Lisbon. 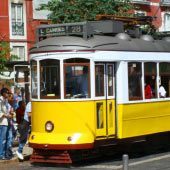 Advice: The 24-hour unlimited Lisbon public transport ticket (which excludes the urban trains) can be purchased from any metro station for €6.40, and is essential while exploring Lisbon. The train journey to Sintra passes through the non-descript residential housing estates that surround Lisbon and there is not much to see. These estates are some of Lisbon’s most deprived and tough areas, so you should use the same common sense you would back at home. The train is safe, but if you are travelling late at night, sit with other passengers, stay away from dodgy looking people and never show off expensive items. Rossio train station (pt-Estação Ferroviária do Rossio) is in the centre of the Baixa district (GPS: 38.71438, -9.14081). 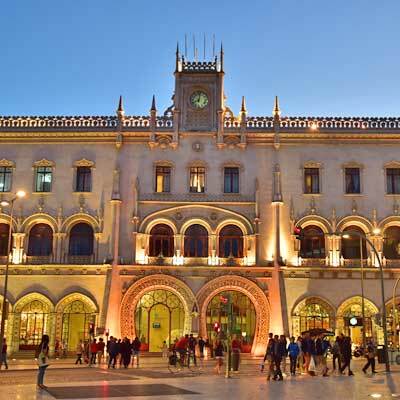 The train station is connected to the green metro line by the Rossio metro station, but you have to exit the metro station and across Rossio Plaza to get to the station. The station is small and easy to navigate around, and all departures from Rossio station head to Sintra. During the peak times (10am-12am) Rossio station can get very busy with tourists, and there can be long queues for the ticket office and ticket machines. The Estação do Oriente (GPS: 38.76712, -9.0991) is the main intercity train station of Lisbon. The station is located within the Parque das Nações district, which is to the northeast of Lisbon, and is 2.5km from the airport. Oriente station is the main intercity train station of Lisbon, and is part of a larger transport interchange, which contains a major bus station and busy metro station (red line). The entire station is always busy, but it is well organised and often easier to travel from than Rossio. The platforms are on the top level, and the train ticket offices are on the level below the platforms. Across from the station is the Vasco da Gama shopping centre, and this has an excellent food court on the top level. Sintra train station (GPS: 38.79870, -9.38646) is the final stop of both train services, but the historic centre of Sintra (GPS: 38.79695, -9.39053) is located 1.5km to the west of the station. Often tourists exit Sintra station a little confused (as it's not that obvious where to go), and are pounced upon by touts selling, tuk-tuk tours, guided tours, and other random means of transport to explore the hills of Sintra. If you want to visit Sintra independently, there are two sensible options to reach the historic centre of Sintra; either walk or catch the 434-tourist bus. 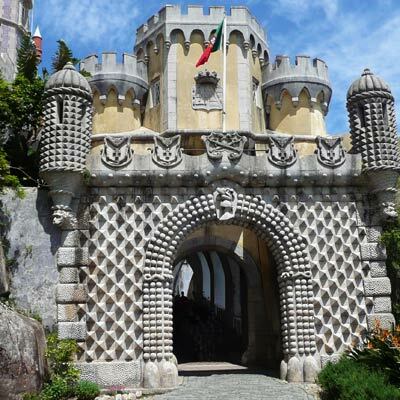 The highlights of a day trip to Sintra are the Palácio Nacional da Pena and the Castelo dos Mouros. 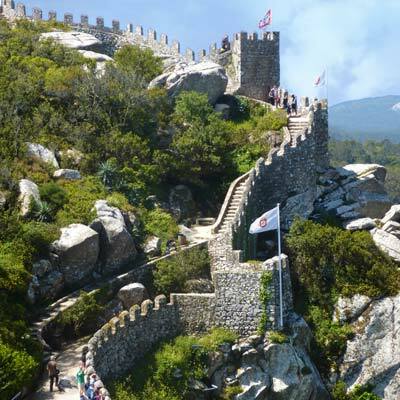 Both of these attractions are in the hills of the Serra de Sintra, and it is a very challenging up-hill hike to them, from the historic centre or the station. The 434-tourist bus service provides a one-directional loop, which connects the station, the historic centre and the hill where the Pena Palace and Moors castle are located. A ticket costs €6.90 and the bus departs from outside the train station. There are up to four departures every hour, but there can be very long queues in the peak summer season. 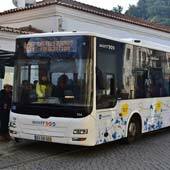 Advice: The 434-bus service is the best and cheapest method visit Sintra, and is how we show Sintra to friends and family. 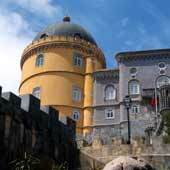 The walk from Sintra train station to the historic centre (GPS: 38.79695, -9.39053) takes around 15 minutes. The route (if you follow the main road) has no steep hills and is very scenic, with great views over the Palácio Nacional de Sintra and surrounding countryside. If for your day trip you are only planning to visit the Palácio Nacional de Sintra and the Quinta da Regaleira, then it is easier to walk than catch the 434 bus. 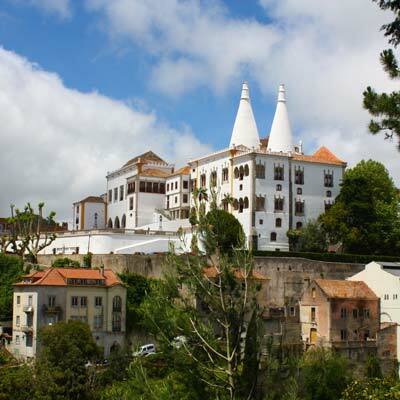 If you are travelling to Sintra directly from the airport, take the metro (red line) to Estação do Oriente and catch the Oriente-Sintra train to Sintra. A single metro ticket from the airport to Estação do Oriente costs €1.50 and is charged to the Viva Viagem ticket. The journey between the airport and the Oriente train station is short (3 stops, 2.5km) and there is no need for a taxi, which will cost much more (€7-10). In the Estação do Oriente, the metro is on the lower level and the station is on the upper level. 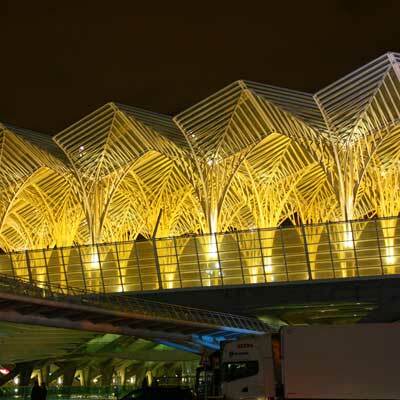 Related articles: Onward travel from Lisbon airport - Lisbon metro. 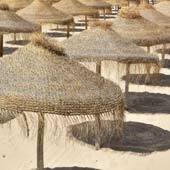 There are two main intercity bus terminals in Lisbon; Oriente and Sete Rios. All international bus services and many private coach companies’ services terminate at Oriente bus station, which is part of the Oriente train station complex. Onward travel to Sintra would be via the Oriente-Sintra train service. Rede Expressos is the main bus company of Portugal and their bus station in Lisbon is Sete Rios (GPS: 38.74111, -9.16666). 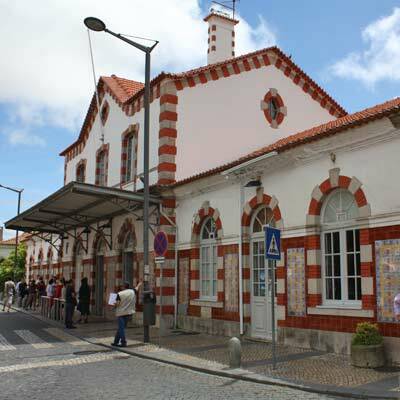 The best means of onward travel to Sintra from Sete Rios bus station is via the Oriente-Sintra train service, which stops at Sete Rios train station. Other regional bus companies (TST, Mafrense, etc) stop all over Lisbon (Praca Espaniha, Campo Grande), for these head to the nearest metro and take the metro to Rossio or Oriente for the train to Sintra. The route from Lisbon to Sintra follows the IC19 highway, west out of Lisbon. The road can get very busy in rush hours as people commute in and out of Lisbon. The roads of Sintra are very narrow, especially the roads which climb the hill to the Pena Palace. Car parking in the historic area of Sintra is very limited and the entire area is very busy during the week. Do not even attempt to drive in the historic section of Sintra at the weekend during the summer months. There are only two car parks in the historic centre, one outside the national palace (20 spaces) and one near the Museu Anjos Teixeira (30 spaces) with only 20 spaces near the Pena-Moorish castles. In the residential side of Sintra (1.5km to the east), close to the terminus of the N249 is a major car park and this is the best option during the summer. Note for visitors from the USA: Lisbon is notoriously challenging for driving; with crowded roads, erratic drivers and virtually no parking and this lack of parking extends to the hills of Sintra. For a holiday to Lisbon, we strongly recommend not hiring a car. Also, public transport in Portugal does contain the same social stigma as in the US, and is used by all.